On a dense, foggy, late July evening in 1956, the Italian-flagged cruise liner "Andrea Doria," bound for New York, was struck broadside by another cruise ship. After an agonizing eleven hours, the relentless sea would drag her down, settling the "Doria" uneasily into the murky Atlantic ocean floor nearly two hundred and fifty feet below. AmazingIy, due to a daring and fevered rescue operation by her oceangoing brethren, only fifty-one of the more than 1,700 people on board both ships were killed in the collision. Years have passed since that tragedy, yet the "Andrea Doria" is still taking lives. 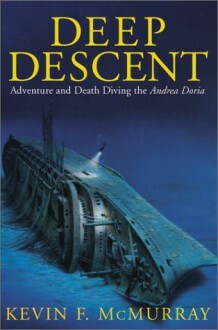 Deep Descent Drawn by the sirens call of adventure, a small but fanatical group of extreme scuba divers has long challenged the "Andrea Doria," pushing themselves far beyond the limits of recreational divers, up to the very limits of human endurance. Not all of them have succeeded. In "Deep Descent," an author and frequent Doria diver Kevin McMurray takes you inside this elite club, offering an unsparing and unsentimental exploration ofthose men and women who dare to go deeper, farther, and closer to the edge than prudence or common sense might allow. Considered the Mt. Everest of diving, the "Andrea Doria" is the ultimate deepwater wreck challenge -- lying in an area long known as the Bermuda Triangle of the Northeast, some fifty miles south of Nantucket Island and two hundred miles east of Sandy Hook, New Jersey. This region, no stranger to disaster, is fog-shrouded and prone to sudden changes of wind, weather, and tide. In addition to many shipping disasters, it has borne mute witness to such recent tragedies as the fatal crash of John F. Kennedy Jr.'s small plane and themysterious downing of EgyptAir Flight 990. It is an area that guards its secrets well, only surrendering its treasures to the bravest ormost determined seekers. Told with a vivid and startling clarity, "Deep Descent" is a story of courage and bravado, of the human spirit overcoming human frailty, and of fearsome risks traded for a hardwired adrenaline rush. With each page, McMurray draws us deeper into the cold heart of the unforgiving sea, giving us a powerful vision of a place to which few will ever have the skills or the daring to go.